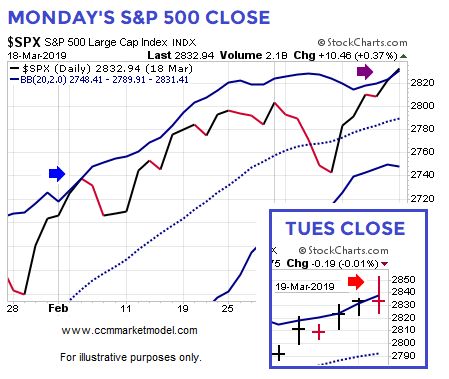 Monday’s session saw the first close above the S&P 500’s upper Bollinger Band (purple arrow) since the current rally began in late December 2018. In early February, the market approached the upper band and then took a very brief pause (blue arrow). Tuesday’s session featured an intraday reversal that started from above the upper band (red arrow). As of this writing, the bigger picture remains constructive. 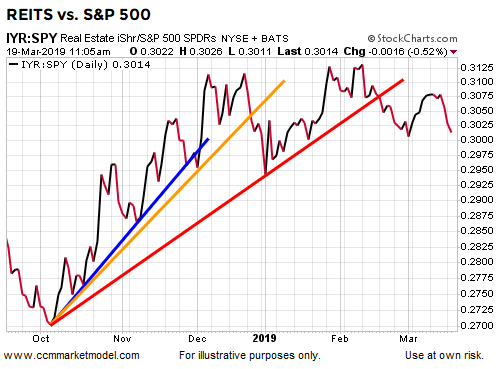 Three weeks ago the S&P 500 (SPY) had just cleared the 200-day moving average (shown in red below) and was approaching the highs made in Q4 2018 (blue horizontal line). 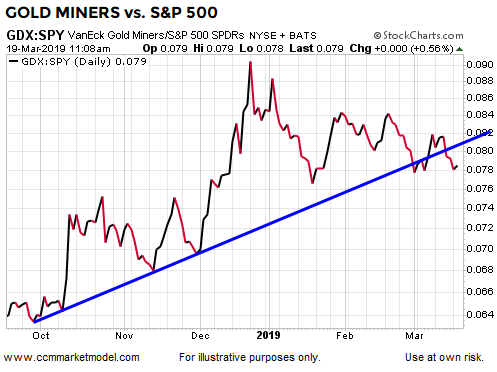 The chart below first appeared in a February 25 post titled “Markets Hovering Near Important Guideposts”. 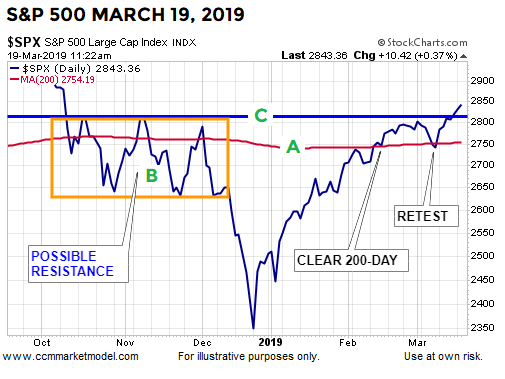 The same chart during Tuesday’s session (below) shows the S&P 500 is currently trying to hold above three relevant areas. 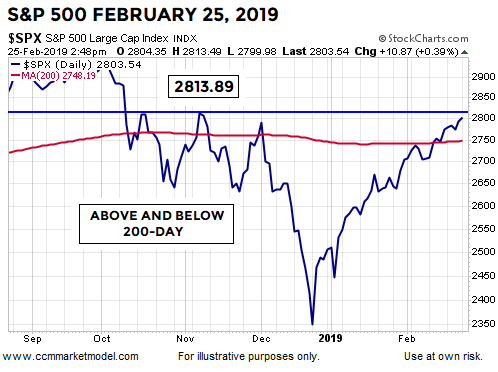 The market appears to have successfully retested the 200-day earlier this month (A). The orange box (B), thus far, has done little to slow the market’s strong advance off the 2018 low. Last Friday, the market closed above the blue line (C) for the first time and nailed down the 3rd consecutive close above the Q4 highs during Tuesday’s session. The blue line sits at 2813; Tuesday’s close was 2832. Wednesday's intraday low was 2812 and change. In the chart above, the longer the S&P 500 (VOO) can hold above A, B, and C, the easier it is to remain optimistic. It should be noted, even under longer-term bullish conditions, the S&P 500 may come back and retest the horizontal blue line which sits at 2813. 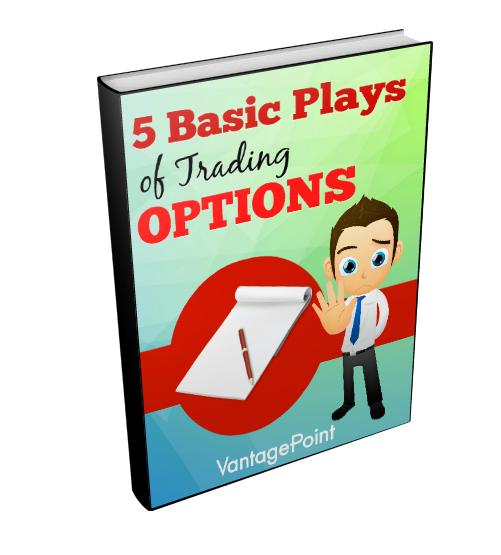 A retest could take place in a matter of days or could come weeks/months later. Wednesday’s Fed statement and press conference could usher in some relevant information impacting the breakout one way or another. 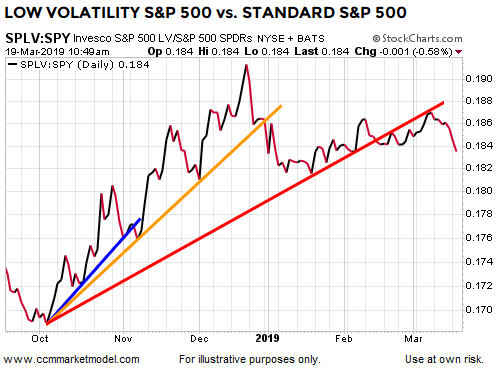 This week's stock market video looks at an extremely rare combination setup for the S&P 500 that was last seen in 1991. The same concepts apply to real estate investment trusts (NYSEARCA:IYR). Viewed in isolation, IYR is still hovering near new highs, but signs of relative weakness are evident on the chart below. 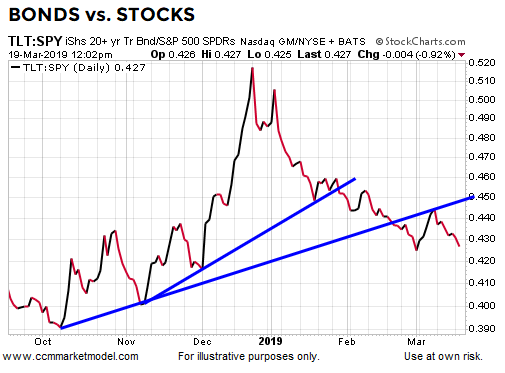 The Fed's dovish interest rate forecast delivered Wednesday could provide bonds, income, and weak-dollar assets with a tailwind, telling us to remain open to a shift on the SPLV:SPY, IYR:SPY, GDX:SPY, and TLT:SPY charts. 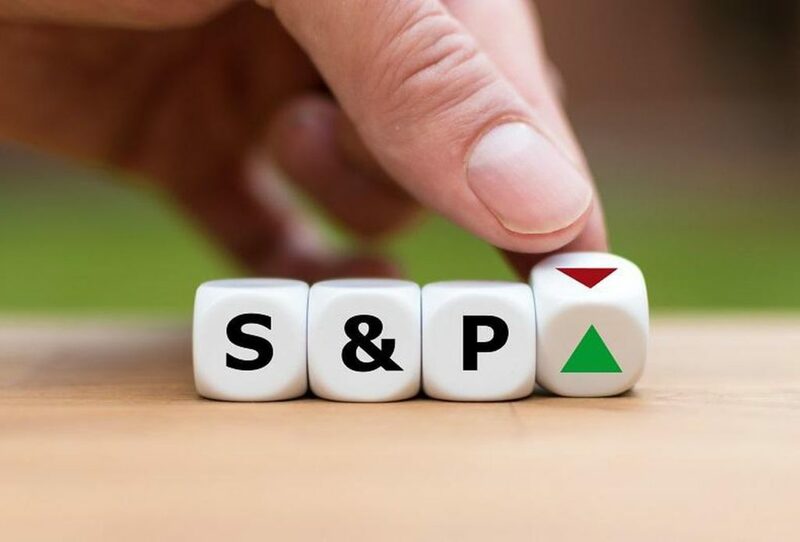 The stock market’s recent short-term extended condition and the reaction to Wednesday’s Fed meeting allow for a pause to see how things play out near 2813 on the S&P 500.